The bold flavors of chicken pad Thai in a simple, easy, healthy and gluten-free weeknight meal that comes together in minutes. Have I ever told you about the taco shop? I mean, I guess I should call it by it’s name now that taco shops are becoming a thing, and there’s a bunch of them popping up all over the place, but I still always call it the taco shop. Anyway, they have tons of creative tacos and everything is served a la carte, so you can get a couple different tacos, all the same, tacos with Mexican street corn (OMG…), or even try out their many varieties of salsa. It is basically a dream come true for this Mexican-food-aholic. I actually can’t believe I have never posted tacos on here before. I mean, I guess it’s because I never actually make them. I make this all the time, and this needs to happen again because it was freaking awesome, but never just regular tacos, and ummm, that needs to change because I think this dinner took me all of 10 minutes, and it was awesome. In addition to Mexican food, I am also obsessed with Thai food. Okay, I’m actually obsessed with peanut sauce. I mean, there are many Thai dishes that I absolutely love, but it always comes back to that peanut sauce for me. Peanut butter + spicy + just slightly sweet? How can that be bad?? Anyway, my peanut sauce does not taste like pure salt. It’s the spicy, peanutty, slightly sweet goodness I mentioned before. 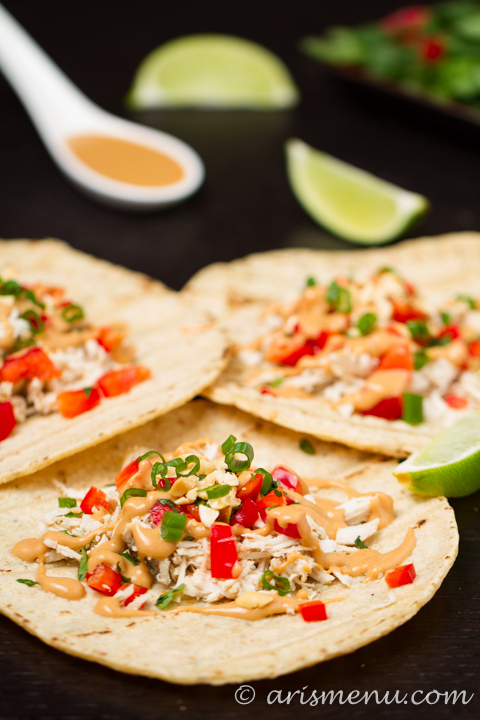 And for these tacos, all you do is throw some shredded chicken and chopped veggies onto some corn tortillas, drizzle your new favorite peanut sauce on top, and then if you want to get fancy (or if you just want the best possible flavor combo) squeeze on some lime, throw in some of my favorite food (cilantro), add some crushed peanuts, and a drizzle of sriracha. You’ll find yourself looking at a dinner that seems so complicated and wondering how you made it happen in just a few minutes. Then when you taste it, you’ll want to recreate it every night forever (and ever). To make the peanut sauce, whisk together peanut butter, coconut aminos, lime juice, sriracha and honey with 2 tbsp water until well combined. Continue to add water 1 tablespoon at a time until sauce has reached desired consistency. 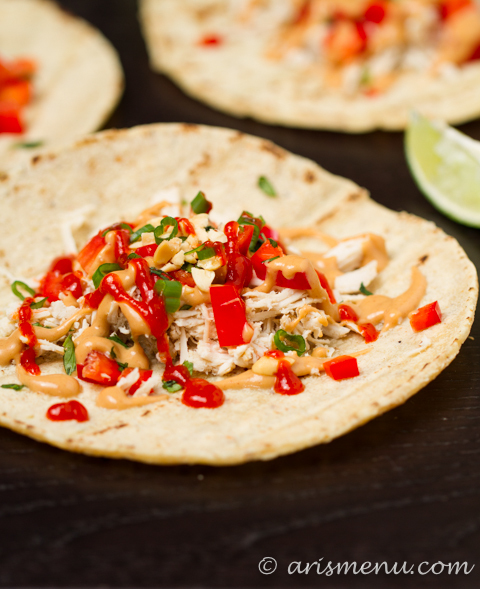 To assemble tacos add chicken, red pepper, scallions, cilantro and peanuts to each warmed tortilla. 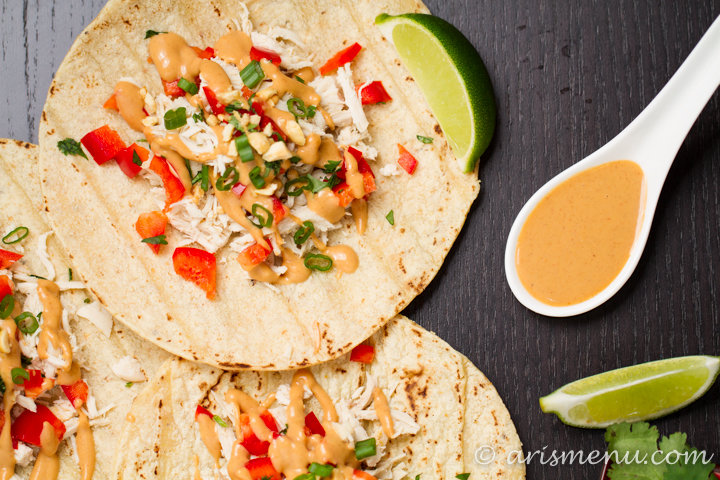 Top with peanut sauce and drizzle with sriracha if desired. Serve immediately. Umm. I used to sprinkle lawrys seasoned salt on my hand and eat it. Sooo, no shame no game right? ….or something like that? I love combining sriracha and peanut flour for a sauce! 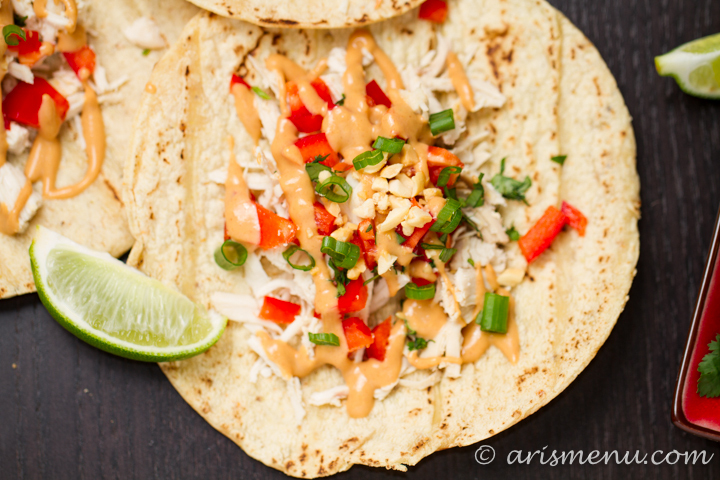 I need to make it again – and try this fun taco! I bet it would make a great burrito too. Yesss! I have never in my life made a burrito…weird, right? But now that you suggested it, I am totally craving one with these flavors! Ugh, it’s so hard to find a good peanut sauce recipe! I’ve never seen it with Sriracha before but seeing as I drizzle that on everything I bet I’d love it. Taco shops…I want one here! I used to use some specific Thai chili sauce, but I ALWAYS have sriracha on hand so I just started using it, and I always love the way it comes out! Come visit me in Phoenix sometime–we have soooo many! Really?? I used to think I hated Thai food, but I’m obsessed with it these days. 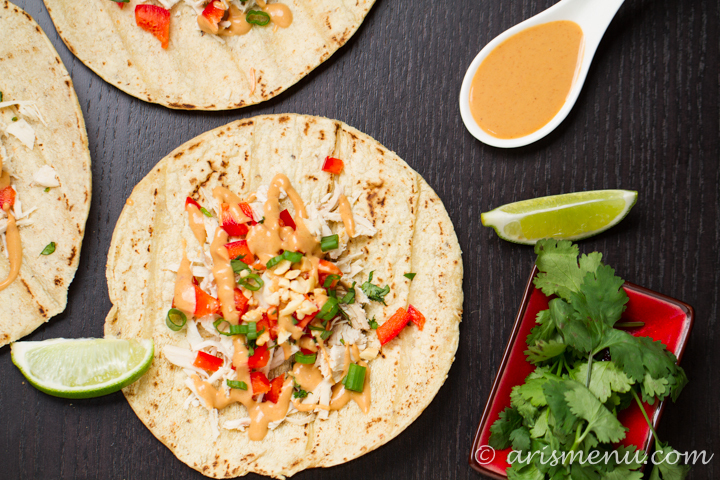 Have you ever tried a peanut sauce using almond butter? Or sunflower seed butter? I bet it would be awesome! any form of tacos are always delicious! 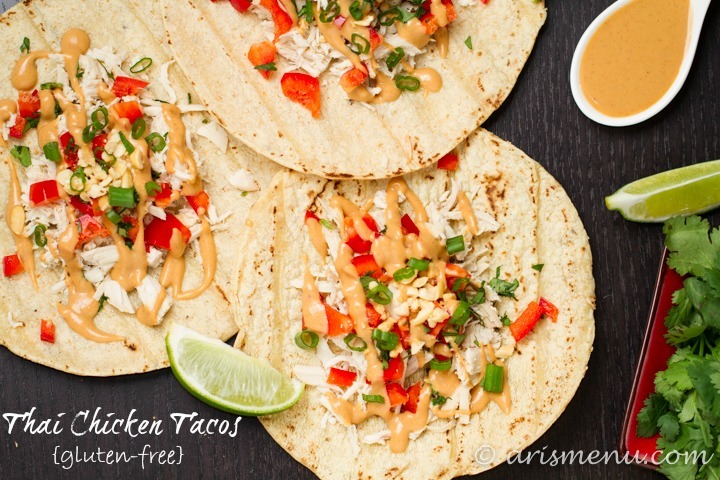 i like the idea of a peanut sauce – i’ve never made that myself before! Don’t you wish there was a plugin or an app for that? I would totally be on board! This looks heavenly- I love Mexican and Thai, so it must be kismet! Plus the sriracha would make hubby man very happy! move to austin please. I need you as a neighbor. I want to taste test everything in your kitchen! LOL! I’ve actually been dying to visit Austin! Maybe I will fall in love and move next door to you? Orrrrr, you could just move to Phoenix! I would love for you to be my taste tester–and you would have to make me tons of healthy bites too!